My name is Rosa Lara. We are a travel specialist based in Córdoba (Southern Spain). I started this project because I want other people to explore this beautiful side of Spain where I was born. Home is where the heart is… and mine definitely belongs here. I feel passion and love for what this region has to offer and I would like to share it with you. We only use local official tour guides who speak fluent English and French to help you understand the history of the most renowned monuments in the world. 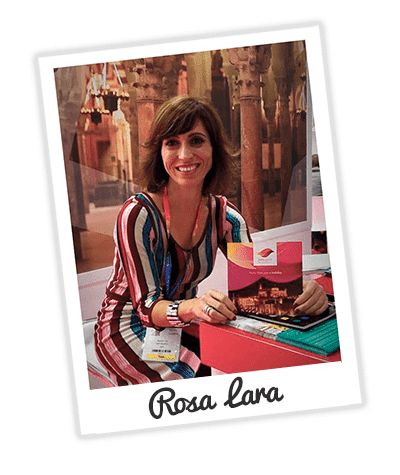 I use my expertise to help you discover the real Spanish life by experiencing the culture, the food and wine and the natural beauty of this country. You will just be a part of us. We offer a high quality personalised service for those travelling independently and for small exclusive groups. At Just Explore we only use pre-selected and pre-viewed high level accommodation. All our recommendations regarding restaurants, visits and entertainments are selected with great care. In terms of transportation, you will be provided with fully insured rental cars or private driver/guide speaking fluent English and French. We just want you to feel at home. Whether you are travelling independently or as part of our small groups, we always design original, distinctive and carefully balanced itineraries. We will plan your stay to stand out and to create unforgettable memories. Just Explore supports sustainable tourism by respecting the natural, human, social and cultural environment. We believe that tourism can contribute to create a better quality of life by discovering other civilizations and cultures.